It was nice to see everyone at bowling tonight. Thank you to NancyV for coordinating the event. And thank you to RachaelW for the awesome cake! This Saturday, May 17th, is Crossover at Camp Flying Eagle. 16009 Upper Manatee River Road, Bradenton. The whole family is invited. We will start at 4 PM with fun and games. Dinner is at 6 PM and a special ceremony at 7:30 PM. I need a head count so we can buy groceries. Cost of dinner is $2 per person. We will be offering burgers and hot dogs. Let me know how many are coming and whether you'd like a burger or hot dog. If you have a fun, outdoor game you would like to share please bring it. So far, we have families bringing corn hole (a.k.a bean bag toss), frisbee golf and ladder toss. 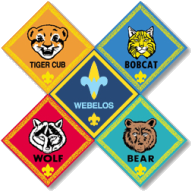 Scouts wear your class B uniform to play in and bring your class A to wear to the ceremony.